Managing Director, Oaktree Joinery Ltd, 1 Moat Road, West Wilts Trading Estate, Westbury, Wiltshire, BA13 4JS. 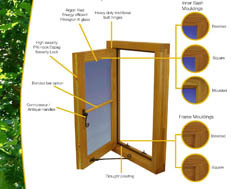 Tel: 01373 858 054 | Email: sales@oaktreejoinery.co.uk 1990-2010 Celebrating 20 years of quality craftsmanship. We’ve developed 5 new videos for you to experience the quality of our products without having to leave the comfort of your own home. In order to do this we’ve been out to a few of our customers sites and made 2 minute videos on the feature front door, french doors, vistafold doors, Sigenia door and the excalibur window range. 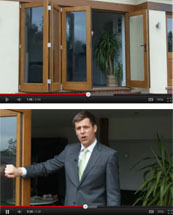 In the future we will be completing this set of videos with others to cover each of our ranges of windows and doors. Working to BS EN ISO 10077-1: 2006 compliance, we are now able to offer all our customers a certificate of U Value certifation to present to building control, architechts or FENSA. 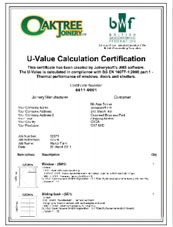 We calculate the excat U Value by analysing the heat loss of each individual component (head, cill, jamb, mullion etc) and the glass. From now on, when you place an order for any of our products we’ll automatcially issue you with your certification so that you can prove the compliance of your windows and doors. You can view the new bar we designed or the numerous windows that we have completed recently by viewing our Facebook Page – and don’t forget to ‘Like’ it for regular updates. We pride ourselves in our craftsmanship and welcome you and your family down to our on site factory/showroom to experience the quality of our work first hand. Alternatively, you can opt for a free window quotation right away by clicking here. 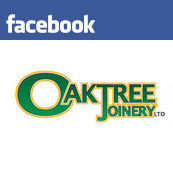 Address: Oaktree Joinery Ltd, 1 Moat Road, West Wilts Trading Estate, Westbury, Wiltshire, BA13 4JS.